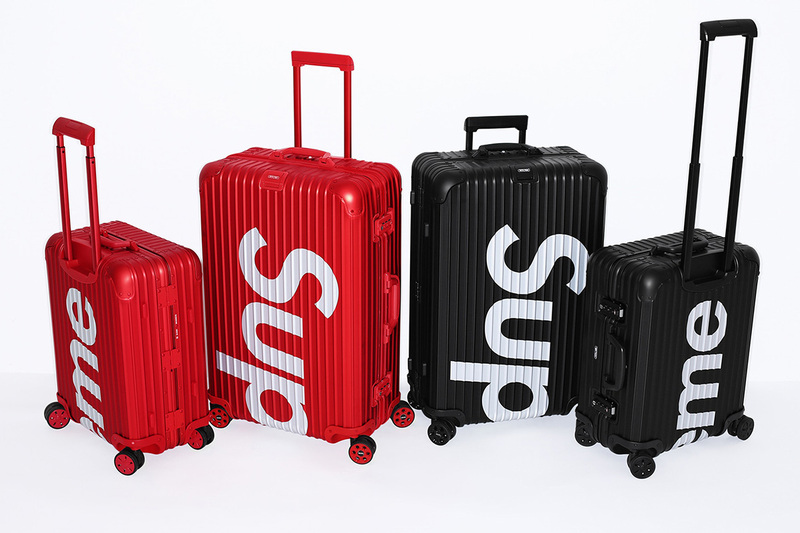 Travel with Supreme X Rimowa Topas aluminium suitcases to match Supreme X Louis Vuitton wallets and bags like true fashionistas ? This Spring, take flight with Rimowa carry on Topas multiwheel 45L cabin luggage* in black or red with Supreme signature white print across the aluminium suitcase and check-in the Topas multiwheel 82L for your globetrotting Instagram and Facebook moments. Supreme New York 2018 luggage features the made in Germany iconic Rimowa Topas multiwheel suitcase with double TSA combination locks and duo internal Flex-Divider systems. 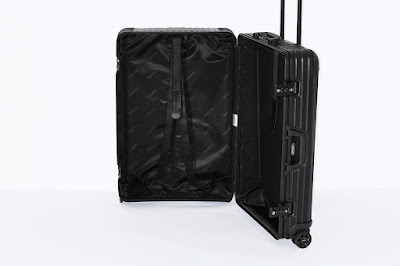 Supreme X Rimowa Topas Multiwheel 45L cabin size are priced at USD1,600 / £1,050 while 82L check-in baggage size price is USD1,800 / £1,150 and for sale at selected Rimowa shops on April 14. Rimowa X Supreme suitcase collection are available at Supreme New York, Brooklyn, Los Angeles, London UK, Paris France at 11 a.m. local time and online at 11 a.m. GMT and EST on April 12. Supreme Japan will stock Rimowa Topas on April 14. *carry on cabin size depends on the Airlines. Check with the carriers before flight departures. The best airline in the world is Singapore Airlines, as voted by TripAdvisor Travellers' Choice awards for Airlines 2018. SIA winning accolades includes Best Airline in the World, Best Airline – Asia, Best International First Class – World, Best Economy Class – World, Best International First Class – Asia, Best Economy Class – Asia, Travellers’ Choice Business Class – Asia and Travellers’ Choice Premium Economy Class – Asia in the popular TripAdvisor list. Qatar Airways Business Class was voted best in the world while Air New Zealand premium economy - was ranked best. TripAdvisor, the international travel planning and booking site uses an algorithm that takes into account the quantity and quality of airline reviews and ratings by global travellers focusing on outstanding service, quality and value over a 12-month period to determine the award recipients. The top ten airlines in the world according to TripAdvisor travellers are Singapore Airlines, Air New Zealand, Emirates, Japan Airlines, EVA Air (Taiwan), Southwest Airlines (United States), Jet2.com (United Kingdom), Qatar Airways, Azul (Brazil) and Korean Air (South Korea). The 2018 Lexus LS 500 luxury car sedan flagship model is the crème de le crème of Lexus, the Japanese luxury brand of Toyota. The supreme Lexus LS 500 series is unparalleled with its aesthetic designed infinite luxury craftsmanship, encasing extremely powerful performance with the world's first 10-speed automatic transmission in its class and most advanced Lexus dynamic control system with an all-new 3.5litre twin turbo V6 engine. Living by its mantra in Omotenashi, Lexus brings true automobile luxury to life with Japanese luxurious interiors rich in Takumi craftsmanship with massage and heated functions, complete with Mark Levinson audio package, its grandeur unveiled at Lexus soirée, in St. Regis Kuala Lumpur, Malaysia. Mr. Akio Takeyama, Deputy Chairman of Lexus Malaysia shared that the new Lexus LS 500, under the visionary leadership by chief engineer Toshio Asahi and chief designer Koichi Suga is the brand’s boldest move in design language and engaging on-road performance, blending a dynamic coupe-like exterior with the spaciousness of a prestige sedan. Applying the Omotenashi, the Lexus way of hospitality means taking care of the driver and passengers, anticipating their needs, attending to their comfort and helping to protect them from risk. Every LS is produced at the Lexus factory in Tahara, Japan, by only the most skilled personnel. Since 1989, four generations of the LS have been introduced and since become a global model sold in 90 countries. Lexus LS 500 Luxury, LS 500 Executive and LS 500h Executive with a Lexus Hybrid Drive is available for the Malaysia market. Customers have a choice of 2 new colours manganese luster and sonic agate to showcase the Lexus bodylines, with up to 11 exterior colours and 6 interior colours/trims (depending on variant). Lexus Malaysia is a division of UMW Toyota Motor Sdn Bhd and is the exclusive distributor of Lexus models with 7 3S centres located in Mutiara Damansara, Penang, Johor Bahru, Sungai Besi, Kuching, Ipoh, Melaka in Malaysia. For new 2018 Lexus LS 500 luxury, LS Executive, LS 500h Executive car purchase priced from MYR800,000 and Lexus range of luxury vehicles, visit www.lexus.com.my or call Malaysia toll free line at 1800 88 53987 for more information.